Not too long ago I posted about Italianate houses on the East Side, and mentioned that stylistically they lost popularity to the nascent Queen Anne Style in the 1870s, and to the related Shingle and Stick Style variations that continued to be built until the end of the 19th centuries as popular so-called Victorian houses. 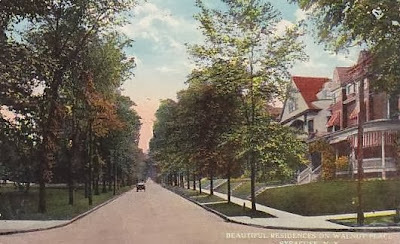 This styles, toward the end of their run in the 1890s, often combined with the Colonial Revival style to include Palladian windows, Ionic or Tuscan columnar porches and other classical elements mixed in with their still variegated roof lines, stairway stained glass, and vestigial corner towers. Syracuse, NY. 106 Victoria Place. One of the four oldest houses on Victoria Place, built before 1892. It combines elements of several Late Victorian styles. Photo: Samuel Gruber 2011. The Queen Anne style became fashionable in the United States in the late 1870s. The style is often called “Victorian” since it is the most recognizable and most visually exciting of all the many 19th-century variations of 19th-century domestic architecture – many of which are equally “Victorian”. Queen Anne, refers specifically to houses that have all or some of these characteristics: an irregular plan, asymmetrical form, hip, multi-gabled roofs or a combination of roof types, towers, dormer windows, stained glass windows, bay windows, turrets (small towers at the corners of buildings), encircling porches, and tall chimneys with decorative brick and shingle patterns are typical. Part of the popularity of the Queen Anne style was due to technological innovations that allowed plentiful and relatively cheap lumber from the Upper Mid-West and elsewhere to be mechanically cut into standard size and shapes, and shipped by railroad across the country. Power saws, lathes and drills allowed an almost limitless choice of decorative details. These could be ordered out of an assortment of builder catalogs and even general mail order retail catalogs. Queen Anne houses and contemporary late Victorian styles were also the first houses to be fully designed with healthful ventilation, as well as internal heat and plumbing, and even gas for lighting. Queen Anne is the style that represents "Victorian" to many people. It is visually the liveliest of the styles of the Victorian era and was popular in Syracuse and throughout the United States. Queen Anne houses were often quite large and date from the last decades when the professional middle class was likely to have live-in domestic help and childcare. For later generations, these houses have been too big (and expensive to maintain) and so have been transformed for apartments, offices or other new uses. The former Babcock-Shattack house, built ca. 1895 and being restored for condominium use, is a good case in point. By the 1930s is was used as a political clubhouse, and after World War II as a meeting place for the Jewish War Veteran's. Syracuse, NY. Walnut Place (Walnut Park). It is not clear which direction we are looking here, and what intersection this is, but on the right you can see a typical house of the time with a wrap-around Queen Anne style porch. Scattered across the Eastside are several Queen Anne and stick style houses, but not so many as their once were, since much of territory for Queen Anne houses, often designed by notable architects, were the new residential districts north of the newly founded Syracuse University laid out in the 1870s. Alas, this prime part of the "Hill" has been mostly ravaged in recent years, as part of the institutional zoning district that has encouraged widespread demolition along University Avenue and adjacent streets. Many fine old houses have been demolished, especially a large number between Ostrom and Comstock taken down to build the Science Center in the 1980s. Others have been leveled for parking lots and parking garages. Some survive, but have been seriously "remuddled" by large scale landlord to turn them into student housing. Mostly, what we find surviving are the either the "bone" of Queen Anne houses, now stripped of much of their original ornament and trim, or more simple houses - sometimes a single gable-fronted upright house, that has been enlivened with small corner turret, or a Stick Style porch, or some other intricate detail. Perhaps the best preserved Queen Anne house in the area (at least on the outside) is the large green towered structure at 623 Euclid Avenue at the NW corner of Lancaster (photo above). This house was already standing in 1892, and belonged to E. L. and Emma Loomis. In 1901 Loomis was secretary and manager of the Bankers Mortgage Company of Syracuse and also was one those who incorporated the new Eastwood Manufacturing Company. In 1910 he was Deputy Superintendent of Poor, a post he held for many years. He had been involved in real estate development with his father Henry H. Loomis, and the two were active in developing the Westminster Tract in which it is centrally located, and many parcels in the sixteenth and seventeenth wards. This is one of the oldest houses in the neighborhood and rivaled contemporary houses on West Onondaga in size and decoration. The present green color is not representative of what would been an original polychromatic paint job that emphasized the many different shapes, angles, and types of siding, especially the decorative shingle patters, some of which still survive. The house's impressive qualities recall the short period of neighborhood development before the streetcar and subsequent congestion on Euclid Avenue discouraged grand houses. Many other houses in the neighborhoods have smaller towers which were only vestiges of the castle-like corner tower. Some of these, like the one perched atop the hill at 4?? Clarendon, are simple late Victorian boxes - with one or more projecting from bays. The addition of the corner turret, however, adds a bit of spectacle to this house. 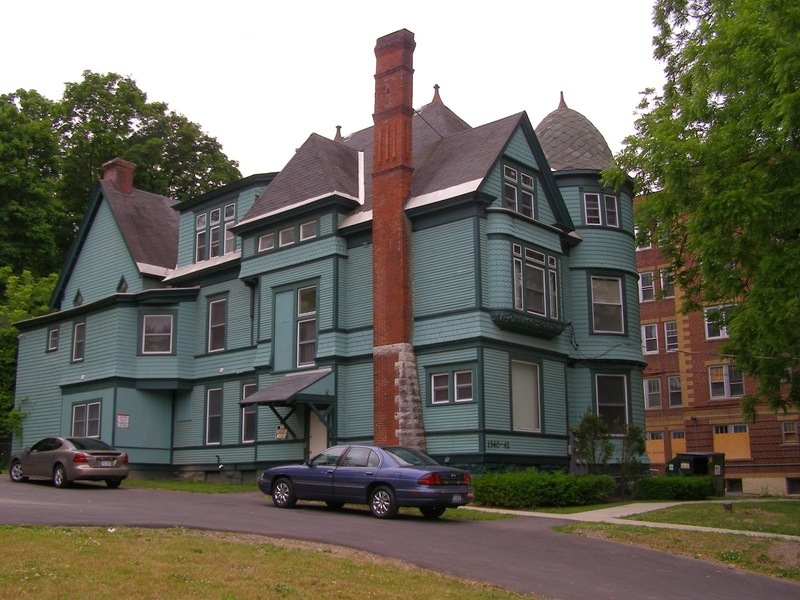 Another large towered house at 737 Comstock Avenue, now a SU fraternity, also has a large rounded corner tower. This much-altered building, when it had a porch and before it was painted white, probably more closely resembled the late Queen Anne style of the 1890s. But like the Babcock-Shattuck (to which it seems related), it already also include Colonial Revival elements. I walked to Downtown yesterday to attend the Sacred Site Symposium at St. Paul's Cathedral, taking advantage of the beautiful day to look at buildings - and our streetscapes lovely and ugly. We are fortunate to have Fayette Park, and the morning sun over the park lit of the sometimes sheer and forbidding facade of the former New York Telephone building (now Verizon), one Syracuse's most austere, and thus least appreciated Art Deco delights Close up, the scale of the building is a little forbidding. After all, it replaced John Crouse's Italianate villa the north side of Fayette Park where it was built in 1928. But the building looks good from a distance, especially looking north on State Street, it has some enchanting detail. The structure hugs the corner of State and East Fayette Street, and the beige colored masonry facade - is it cut stone or cast stone? - always looks warm in the sunlight. The original skeleton steel tower on the northwest corner of the building was replaced by an enclosed microwave tower in 1969. This added a certain heaviness to the composition, but it is also more linked to the 1969 northern addition, and so the Art Deco building can be viewed more-or-less distinctly. Best of all is the intricate and delicate incised carving around the doorway and large ground floor windows, on the corner, and up near the roof level. The building was designed by Voorhees Gmelin & Walker, who were tasked with designing New York Telephone buildings across the state. Ralph Walker, one of the great Skyscraper architects of all time, and the man most responsible for creating the iconic stepped setback skyscraper in response to New York 1916 zoning law, designed the flagship New York City telephone building, now known as the Barcley Vesey building, in 1926. 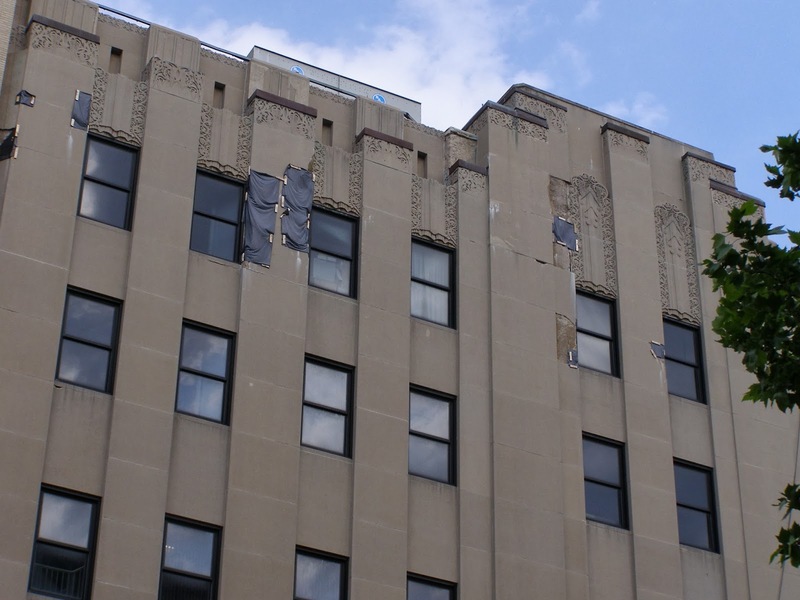 The Syracuse building also shares with the New York Telephone Building annex in Buffalo, also designed by Voorhees Gmelin & Walker, and built in 1930, some decorative features, especially the extremely flat and shallow relief decoration. Buffalo, NY. New York Telephone Building annex. Voorhees Gmelin & Walker, archs., 1930. Unlike the Syracuse building, this six-story annex mixes brick and stone facing. Photo: Samuel Gruber 2013. Over the past few years I have frequently reported on this blog about the many religious buildings in Central New York - remarkable for their history, architecture, art and often vibrant congregations. These buildings and the many activities which they house are mainstays in many neighborhoods. They are landmarks of architecture, landmarks of community, and landmarks of the spirit. As we all know, many of these building are threatened with slow neglect or a quick demolition. Changing demographic and worship patterns often mean declining congregations and limited congregation resources - financial and human. Aging building that have not been maintained often face staggering costs to be brought up standards of safety and integrity appropriate for regular use. The problems are many - but so are the solutions. 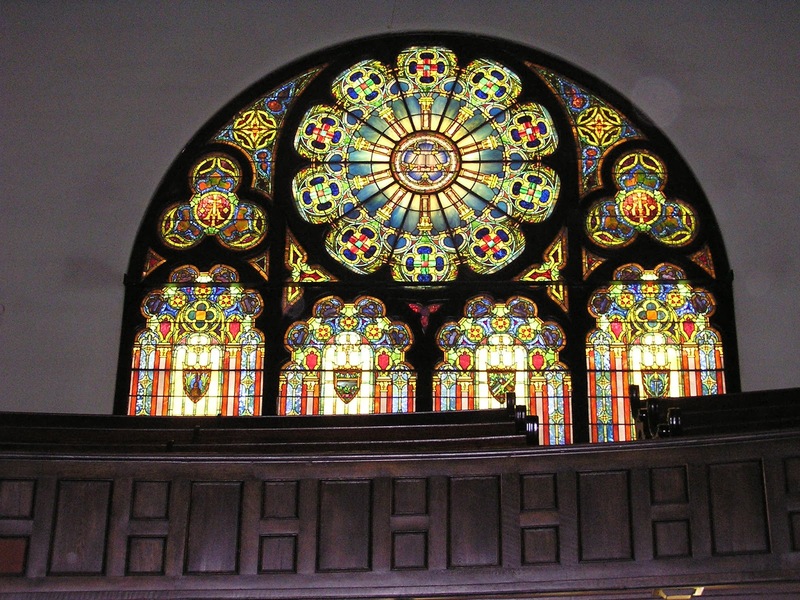 Many local congregations have been steadfast in their care for their historic buildings, and others have been innovative in how they have adapted and shared use, and planned for the future. Outside of Central new York was can also turn to many cities with similar problems - that have also forged community solutions. 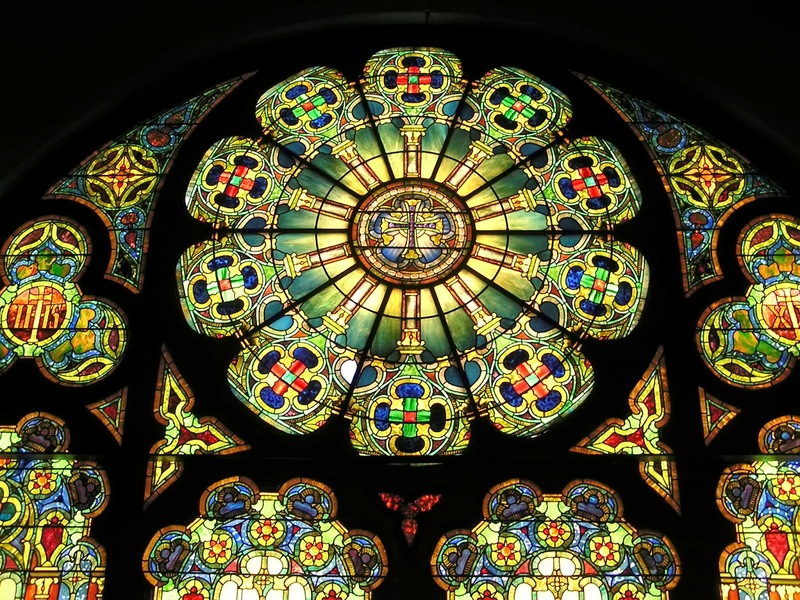 The Preservation Association of Central New York (PACNY) will offer an opportunity to explore problems and solutions at an all day symposium to be held at St. Paul's Episcopal Cathedral on Montgomery Street on Saturday, November 16th. I am thrilled that Bob Jaeger, president of the nationally active Partners for Sacred Places with which I have for more than 20 years, will be the keynote speaker. To my knowledge this is the first time in more than a decade that this topic has been publicly addressed. I hope that it will set off a chain reaction of discussions and actions. There is so much w can all do to help. Here are the details. I recommend registering on-line, but you can also do so on-site before the symposium. ‘SACRED PLACES SYMPOSIUM’ will take place on Saturday, NOVEMBER 16th from 9:30 am to 4:15 pm, at St. Paul’s Episcopal Cathedral, 310 Montgomery Street in Syracuse, New York. The Symposium will bring together an array of expert practitioners to discuss the issues that can determine the fate of these magnificent community places, and the neighborhoods that surround them. Attendees will be able to choose from sessions offered in two learning tracks: SUSTAINING SACRED PLACES, or RE-USING FORMER SACRED SITES. The Keynote Speaker will be A. Robert Jaeger, Co-Founder and President of Partners for Sacred Places, who will discuss the importance of protecting, preserving, and repurposing our Sacred Places. Mr. Jaeger is the co-author of Sacred Places at Risk (PDF, 1998) and Strategies for Stewardship and Active Use of Older and Historic Religious Properties (1996), author of Sacred Places in Transition (1994), and editor (from 1985 to 1989) of Inspired, a bi-monthly magazine with news and technical articles on religious property preservation. Specific ‘Sacred Places’ topics will include: Conditions Surveys, On-Going Maintenance, Energy Concerns, Historic Significance, Funding Possibilities, and Preservation Networking – with case studies including Grace Episcopal Church, Syracuse; Lafayette Avenue Presbyterian Church, Buffalo; and Friends of Corpus Christi, Inc., Buffalo. This symposium will also address Cultural Identity; Community & Neighborhood Stability; Economic Value; and New Uses for Sacred Places – with case studies including a Community Facility – Willard Memorial Chapel, Auburn; Restaurant – The Benediction Café, AME Zion Church, Syracuse; and a School – Martin Luther King Charter School at St. Mary of Sorrows Catholic Church, Buffalo. Registration: There will be a registration fee of $40 for the all day symposium which will be offered to the general public, with a discounted fee of $25 available to PACNY members. Symposium registration and PACNY membership options are available on our Event Registration Page.